If you feel like a few days of spectacular Jazz this summer you could do a lot worse than join me in Antwerp for Jazz Middelheim from 12-15 August. Set in a beautiful park, a short bus ride from the city centre of one of Belgium’s most interesting and cosmopolitan cities, this is a festival of the type we simply don’t get in the UK any more. Middelheim has been going for over 30 years, but still retains a sense of adventure, its all in one massive tent, and over the weekend you will here everything from Swing to Avant Garde, from Jamie Cullum to John Zorn, and lots of interesting stuff in between. By British standards the festival has a fine selection of food and drink -although with the current state of the Euro its not cheap! On the other hand the entire festival comes for a weekend ticket price of € 118,00 for all 14 concerts - and the music is top quality! Brits have a reasonable representation, Mathew Bourne guests on the opening concert with an interesting looking Belgian group - Trio Grande; and that first day that closes with harmonica maestro Toots Thielmans who is the key patron for the festival. Saturday is devoted entirely to the music of John Zorn’s Book of Angels. Zorn has always been a controversial figure both for his avant-garde approach to music but also for his overt Jewish religious symbolism and his ambivalent, or at least unclear, political views on on Israel. Leaving that aside, his music has covered jazz, rock, classical, film music, klezmer and lots more. It moves from the most accessible of melodies to the most extreme of free improvisation. However his position as a giant of the New York scene and of jazz in general is not in dispute, although I find it difficult to imagine a major jazz festival in the UK devoting a whole day to music that is so clearly not commercial. And yet he is a regular at Jazz Middelheim. At the end of 2004, Zorn wrote 300 tunes for his Masada project, each one named after an angel. This material became The Book of Angels. The music can be found on 15 CDs performed by different groups – and one of the key characteristics is the sheer quality of artist that he can attract to perform his music. Then we hear from Mycale – a quite astonishing female a-capella group from Israel, Morocco and Argentina. That’s followed by what is known as the Bar Kokhba Sextet which is definitely very accessible music. - Marc Ribot on guitar, Mark Feldman and Erik Friedlander on violin and cello, Greg Cohen on bass, Joey Baron on drums and Cyro Baptista on percussion. And then finally the more aggressive Masada Sextet which has the same rhythm section, but changes out the lead artists for another brilliant batch comprising John Zorn himself on alto, Dave Douglas on trumpet and Uri Caine on piano. This may not be to everyone’s taste, but it demonstrates an appetite for innovation that you can only admire. Sunday is a more relaxed day featuring amongst others Dave Douglas, Allen Toussaint and finishing up with Jamie Culllum.Monday starts with a solo set from Cuban pianist Omar Sosa, continues with the veteran free improviser Fred van Hove and his Octet (including Evan Parker) then features the Randy Weston African Rhythms, and the festival finishes with Charlie Haden’s Liberation Orchestra (following their recent 5 star concert at the Barbican) with Brits including Andy Sheppard, Oren Marshall, John Parricelli, and Jason Yarde.I first went to this festival a couple of years ago and I can heartily recommend it – but you need to go with an open mind. For those of you that can’t make it, I’ll report back after the event! The Matthew Bourne-Trio Grande collaboration has been going for a while. (I played a track on my own show yesterday.) They now have 2 albums on the WERF label. 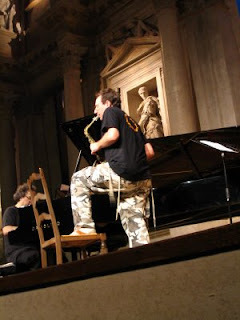 The chance to get to hear Zorn play at all nowadays is one to be savoured. Especially with a list of collaborators like that which Peter mentions. Unfortunately, it's one of those hard choice weekends in Belgium. On the other side of the (language) border is the Gaume Jazz Festival, which coincidentally first got Bourne andTrio Grande together. Slightly lower in terms of profile of acts, but well worth the journey for quality. Grrr. 2 totally great sets with Bar Kobha and Masada Sextet, both sets were fantastically well played featuring the usual Zorn suspects. An urgent, expressive, intense mix of jazz improvisation, klezmer, blues, surf rock, middle-eastern and swing. The festival crowd laped it up, standing ovations baying for encores , while the rain beat down on the tent roof : a great night to remember.